PTSD, or Posttraumatic Stress Disorder, is a diagnosable mental health condition. Some people develop PTSD after extremely stressful or traumatic situations. These may include being witness to a life-threatening event (disasters, accidents, military combat, etc. ), neglect, divorce, abuse, abandonment, assault, or the suicide or death of someone close to them. Teens and others who have suffered or witnessed major trauma may feel edgy or restless. They may relive the moments in their minds or have insomnia. This is normal behavior for anyone who has experienced something traumatic and most people begin feeling better within weeks to a few months. 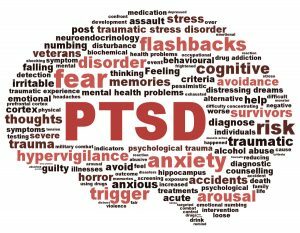 However, those with PTSD will continue having these and other symptoms for an extended time period or may see them come back much later when triggered by similar events. This is when the initial stress of trauma could be described as actual Posttraumatic Stress Disorder. Parent’s who recognize symptoms of PTSD in their sons or daughters should seek a professional diagnosis. HOW COMMON IS PTSD IN TEENS & KIDS? PTSD is probably more common than you think. In the United States alone, divisions for child protection receive about 3 million reports per year. It is estimated that the incidents prompting these reports affect 5.5 million children. Around 30% of reports received show evidence of different types of abuse. This abuse may come in the form of neglect or physical, mental or sexual abuse. In addition, it is estimated that 3 to 10 million children per year witness or experience family violence, with 40-60% of those cases involving physical abuse of children. Making these numbers even more staggering is the estimation that two-thirds of child abuse incidents actually go unreported. As you can imagine, with these numbers many children and teens are bound to suffer from PTSD. Studies have shown that 15-43% of girls and 14-43% of boys have experienced at least one traumatic event. Of those, 3-15% of girls and 1-6% of boys will develop Posttraumatic Stress Disorder. For certain groups of sufferers, those rates are higher. 1. For the majority of kids, PTSD symptoms will diminish over time and eventually disappear after a few months. However, talking openly about their trauma with parents, professionals, or seeking out therapy or a residential treatment center is always a good idea. Help them understand that they are not responsible for the poor choices of others, or the situations they were placed in. If your teen is suffering from PTSD, he or she will most likely exhibit some of the following symptoms or behaviors. As a parent, if your son or daughter has experienced trauma, and seems to be showing several of these signs, it’s important to reach out for professional guidance as soon as possible. With guidance from you and a qualified counselor, therapist, residential treatment center, or therapeutic boarding school, teens can learn to help manage and reduce their own PTSD on a daily basis. This should be the first thing your teen feels from you after trauma. Encourage your teen to talk to you about the trauma and how they are dealing with it. Remind them that they are not at fault. You may feel guilty about not “protecting” your child from trauma. This can be misinterpreted, sending the message that you actually blame them for what happened. Your teen may need counseling or therapy. Getting them the help they need is part of giving them the tools they can use to manage their stress going forward. Your teen’s PTSD is a complex issue, and may have more than one contributing factor. At Sundance Canyon Academy, we can help your teen identify and deal with the cause of their stress, and learn how to manage it effectively with our therapeutic boarding school. Successful treatment of PTSD may require a multi-faceted approach, including different types of therapy, medication, constructive coping techniques, and more. Sundance Canyon Academy can provide Cognitive-Behavioral Therapy (CBT), crisis management or Psychological First Aid, and other treatments that may be difficult for parents to find and therapists to provide on an outpatient basis. Aside from PTSD treatment, Sundance Canyon Academy provides a well-rounded education that meets your teen’s academic and mental health needs. Students receive individual attention and care from both experienced teachers and mental health providers. Students receive the therapy they need, along with the education and life skills you know will help them throughout their lives.